Q. What are the best vehicles to buy in Pasadena, TX? A. It all depends on what your needs are! We’d recommend the Honda Odyssey or Honda Pilot for a family vehicle. Need something smaller that’s good on gas? Take a look at the Honda Accord or the Honda Civic Hybrid. Want something with a hatchback for you and your dog? We’ve got you covered with the Honda Fit or Honda Insight! Whether you’re in League City, Pasadena, or Bryan, Texas – it’s no question that a Honda is the best vehicle you can purchase in the Houston area! Q. Where can I buy a Certified Pre-Owned Honda in League City, Texas? A. Big Star Honda has a Certified Pre-Owned Program so that you can get the warranty you need on your next pre-owned Honda. View our Certified Pre-Owned vehicle inventory and schedule a test drive! Q. Where can I sell my car in Bryan, TX? A. Right here at Big Star Honda in Houston, TX! We buy used cars and would love to take a look at yours! Get started online using our free tool and see how much your car is worth. You can use your current car as a trade-in or we can buy it outright. Q. 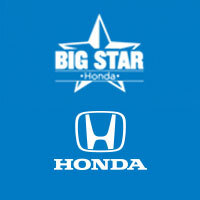 Does Big Star Honda have any used or new car specials? A. Absolutely! We have specials on new cars, pre-owned cars, service, and parts! Don’t forget to check back often as we frequently add specials. We also honor all of Honda’s incentives valid in the League City, Pasadena, Houston, and Bryan, Texas area!